The Storm WildEye Swim Shad is the ultimate pre-rigged swimbait! The Swim Shad is tough, yet has a soft outer body and is weighted internally which makes them ideal for a life-like swimming action. 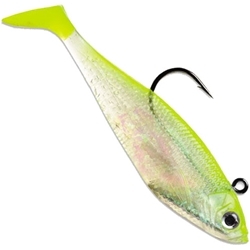 Features a Holographic 3D Wildeye and Holographic Swimmin' Flash Foil to create the flash of real baitfish. With the flash to mimic a school of baitfish, the WildEye Swim Shad is perfect to fill an Umbrella rig! The 4" Swim Shad are rigged with a superior 3/0 VMC Needle Point Hook and are 7/16oz.